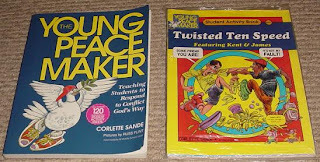 We just finished using "The Young Peace Maker," by Corlette Sande. There are twelve weeks of lessons which are geared towards teaching the intermediate and middle schooler how to respond to conflict God's way. This set includes a teacher's manual and twelve student activity books. The activity books are designed like comic books and contain a story of conflict and how to glorify God. At the end are activities which the child can complete along with additional activities in the teacher's manual. These help to reinforce the lesson being taught. In the teacher's manual there are scripture references to indulge in and drive home the message God has for us. I found this program to be very through in how to glorify God when in the middle of conflict or how to best avoid it. So often in life we and our children find our selves on the slippery slope of conflict. It is important to know how to deal with it or avoid it, particularly when dealing with a non-believer. They way we handle a bad situation or avoid one can help others to see Jesus in us. This was a great study and I would love to go through it again with the boys, we all learned a lot. I bought my set used this year and will love to pass it on to someone else. I am selling my complete set for $19.00 postage paid. Note that one of the activity pages has been written on. Here you can view the thoughts of others concerning this program.